Our brains are like muscles, and if not used, will decline in abilities and function. Despite popular belief, cognitive decline is not a normal symptom of aging. A decline in activity and responsibility does help advance the decline and, in the elderly, the signs become more prevalent. 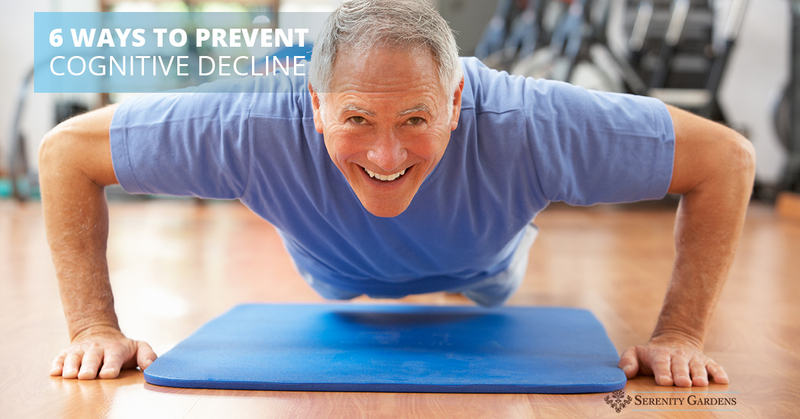 The good news is, there are ways to slow or completely prevent cognitive decline. 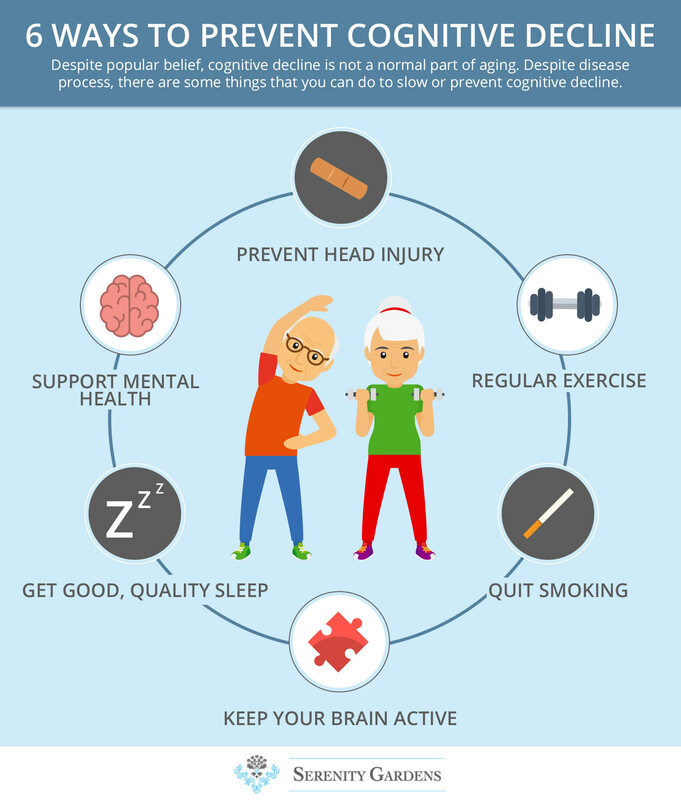 While not all head injury is preventable, there are things that you can do to help protect your brain inside your head. Wearing seat belts in cars and wearing helmets on bikes, motorcycles, skis-snowboards, and skates is a start. Avoid sports such as boxing, football, and hockey, or play non-contact recreational sports. If you do sustain an injury, be sure to have it checked out to prevent long-term injury. As we age, falls become more prevalent, that can cause a head injury. Preventing falls is important to avoid cognitive decline. Any cardiovascular exercise that promotes blood flow throughout the body helps to supply the brain with much-needed oxygen. This helps with focus, memory, and overall brain health. The good news is, in addition to brain health, regular physical activity also helps with heart health, skin health, and respiratory health, all of which will help you live a longer, healthier, more comfortable life. Heart health is important to prevent other diseases such as diabetes and hypertension, which can contribute to cognitive decline. One of the best ways to prevent cognitive decline, despite disease process, is to keep your mind active. Continually challenge your mind with new activities, learning, reading, or doing puzzles that require you to focus and think. This does not mean that you need to take college classes or read difficult books, learning new skills or engaging your creative side also helps to activate neurons that support brain health. Smoking tobacco has been linked to cognitive decline related to decreased blood flow to the brain. The advantages of not smoking are so numerous that it doesn’t make sense not to! With all the activity we have mentioned and how to stimulate your brain, resting may seem contradictory. However, catching good, quality sleep is critically important for your brain health. When you sleep, it allows your brain to process information and allows you to focus better while you are awake. Getting good-quality rest helps to support the proper functioning of your brain and keeps it from being stressed out. Research suggests a strong link between poor mental health – untreated depression – and cognitive decline. Keeping a healthy brain involves more than the physical structure and also includes the mental portion. If you suffer from any form of mental illness, seek treatment to help support your mood and your brain. Having a positive outlook on life has been attributed to better cognitive function. Many people tend to believe that cognitive decline is a normal part of aging, however, this just isn’t true. Your mind can remain sharp as long as your heart keeps beating if you give it the proper support it needs. If you suffer from an illness or disease that attacks the brain and affects cognition, following these tips can help to slow the progression of the disease and fight the cognitive symptoms. For more information or to get quality memory care for you or your cognitively impaired loved one, contact us at Serenity Gardens today!